Ctenophores (pronounced “TEEN-o-fours”) are mysterious ocean drifters found anywhere from the ocean’s edge to the deepest parts of the ocean. Colorful, translucent, and delicate, these predators slip through ocean waters capturing other animals, typically using their long, sticky tentacles. Marine biologist Steven Haddock of the Monterey Bay Aquarium Research Institute (MBARI) and his fellow researchers have embarked on an ambitious project to collect, compare, and understand the evolutionary history of these remarkable animals. The project’s name, DEEPC, is an acronym for Diversity, Ecology, and EcoPhysiology of Ctenophores. Supported by a grant from the Dimensions of Biodiversity Program of the National Science Foundation, the DEEPC team is currently hard at work. The researchers are especially interested in ctenophores’ ability to survive a wide range of ocean conditions. One major thrust of the DEEPC team’s investigations is to search for the genetic changes that made it possible for groups of shallow-water ctenophores to evolve and adapt to the crushing pressure of the deep sea, and for deep ctenophores to adapt to surface conditions. When it comes to understanding genetic change and evolution, ctenophores are both useful and challenging animals to study. They are found in many parts of the ocean, but are difficult to capture alive. Most importantly for the DEEPC team, ctenophores as a group have a long and complicated evolutionary history. Over many generations, some groups of ctenophores evolved from shallow-living animals into deep-sea creatures, but other groups may have gone the other way—from the deep ocean to the shallows. This gives scientists a unique opportunity. With ctenophores from distantly related groups evolving similar responses to their environment (a process called “convergent evolution”), researchers can tease out the specific genetic changes that allow each group to succeed. For example, every organism must be able to metabolize, or process food into energy. This involves the use of a set of classic enzymes, Haddock says, that are found in slightly modified forms in many different creatures. Both deep-sea and shallow-water ctenophores have those enzymes, but they function differently under the immense pressure at 2,000 meters than they do near the surface. That means that in many different species of deep-sea ctenophores, these enzymes are likely evolving similar features that allow them to work deep below the surface. Researchers looking for those similarities will be able to compare enzymes in different ctenophores to determine how that evolutionary process might have occurred, and what evolutionary changes are necessary for an animal to live in the deep sea. Joining Haddock as principal investigators in the DEEPC project are Erik Thuesen at Evergreen State College and Joseph Ryan from the Whitney Laboratory for Marine Bioscience. 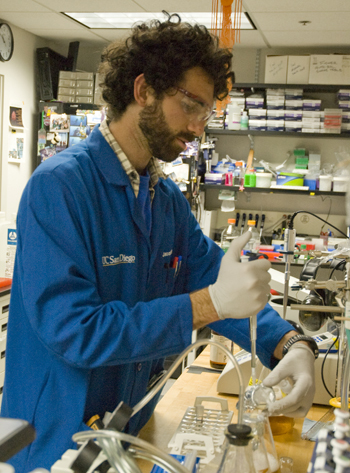 At MBARI, the DEEPC team also includes Jacob Winnikoff and Darrin Schultz, graduate students in Haddock’s lab. These researchers have a wide variety of backgrounds, experience, and resources, which all come into play in analyzing the evolutionary history of ctenophores. For example, some members of the group will study the genetic material of ctenophores while others will examine the physical products of their genes, such as proteins and enzymes. Because ctenophores are difficult to find and capture, each collected animal is precious to the researchers. Most of the time, says Haddock, they collect an animal, freeze it, and sample its tissue to preserve its genetic material for later extraction and analysis. But if the researchers want to experiment with proteins and enzymes, they need to collect multiple animals to get enough tissue to work with. “We may just see one of these things,” Haddock says, “so we can’t just take it and grind it up.” To address this issue, Jacob Winnikoff is extracting ctenophore DNA and inserting it into bacteria, which then produce a larger supply of the enzymes of interest. The researchers can then run experiments on those bacterially produced enzymes, inspecting how they work under high pressures, without destroying rare specimens. With genetic codes and a supply of enzymes to work with, the researchers hope to pinpoint exactly which changes in DNA are necessary to create enzymes that can function at high pressure. Eventually, they may even be able to make changes to the bacterially produced DNA to test how various species of ctenophores might have evolved during their long journeys to or from the deep. The DEEPC project intersects with many of Haddock’s other research interests. 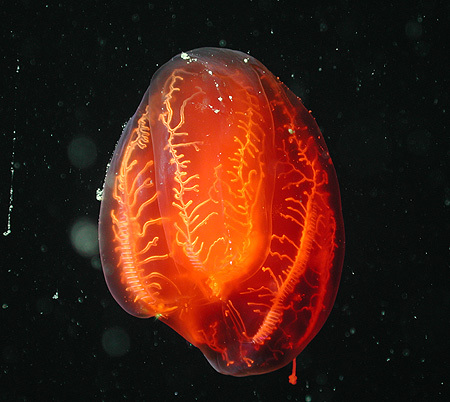 For one thing, the work the DEEPC team is doing will contribute to a worldwide ctenophore survey Haddock has been working on, which will eventually describe all of the known species of ctenophores and their relationships to one another. This research might also contribute to an ongoing debate about the position of ctenophores in the tree of life. Among biologists there is active disagreement as to whether sponges or ctenophores were the earliest group to branch off from other members of the animal kingdom. Although Haddock doesn’t intend to publish a paper to directly address this controversy, it’s likely that some of his team’s work will shed further light on the history of animal evolution. 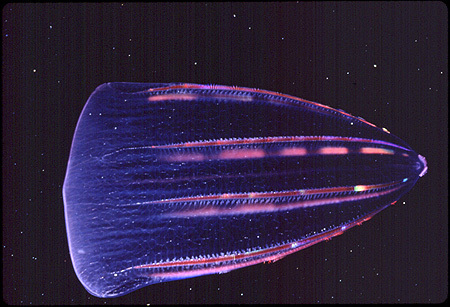 Another reason Haddock studies ctenophores is to learn more about their bioluminescence, or the way they produce and emit light. 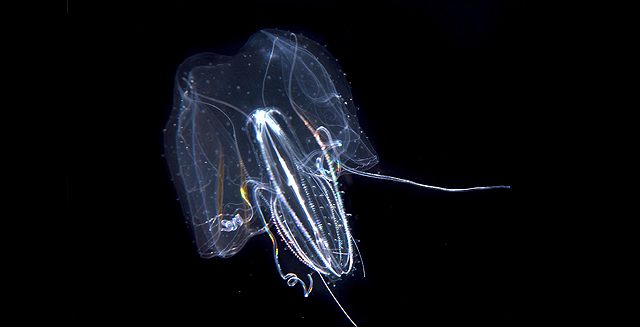 Although over 90 percent of ctenophores in Monterey Bay make their own light, the mechanisms and evolutionary benefits of this bioluminescence are not well understood. Haddock has long been fascinated by the glowing inhabitants of the oceans, and is considered a world expert in the field. As the DEEPC project progresses, the team hopes to answer long-standing questions about evolution in the oceans and the ability of ctenophores to live under a wide variety of conditions. From Haddock’s perspective, the project will also shed some much-needed light on a group of animals long relegated to obscurity. With all the work being conducted by the DEEPC team, we’ll soon know much more about these delicate, drifting, glowing predators. And we’ll know much more about their remarkable adaptation to their wide range of habitats, and perhaps the evolutionary processes that helped them survive.